Designed for the transportation of a range of automobiles, hydraulic Car Lifts from Hydrax are heavy-duty and built for stability. 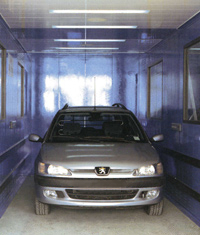 Car Lifts are excellent for space-saving in storage and car parks, and designed for simplicity. A series of user-friendly controls, panels and user-aware sensors ensures that your system runs smoothly, without end-user confusion. Hydrax designs and manufactures to all relevant standards and specifications, and supports your lift installation from start to finish.